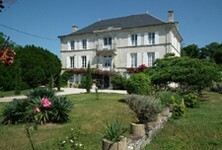 Stunningly renovated chateau with gate lodge and 2 gites on 5,3 hectares with pool and views ! The Domaine de Rochebonne, half way down the west coast of France, had been for sale for... I think it was nineteen years, when we bought it. Funnily enough, when we drove past it the very first time my husband commented "I wonder which idiot is going to buy that?" A year later we drove past it again and decided the idiots could be us. Many years earlier it had been split in to a pair of semis by brothers who didn't get on. One half had been abandoned during the Second World War - that half had been empty since 1943! The other half had not been lived in full-time since the 1960s, though it was occasionally used as a kind of eccentric holiday house. Apart from the fireplaces there was no heating at all, and just the one outdoor WC. Bath or shower? No - nothing like that. Everything but everything needed to be done. The wiring (where there was wiring) was old and dangerous. There was only cold water in one downstairs room. The roof was on the point of collapse - in fact we put some acrow props in situ before the purchase was complete, because it was clear the roof could go at any minute. Sometimes we watch these Grand Design programmes on TV, or read blogs by people who have done similar - and we certainly rate up there among the most ambitious, the least financed and the hardest working. With three small children, cold winter weather and virtually no money we set about the conversion - well, you have to come and look to see how it has changed. We did the worst of it in a year and by that I mean we got comfortable - central heating, plumbing, kitchen and so on. Then the decorating took place a little bit at a time over several years. And the furnishing. And the pool. The first month was spent just clearing rubble and rubbish out of the way. Some amazing old items we kept, restored and now have them on display, but a huge amount needed to be taken to the dump - miles and miles of bottles, old mattresses, old duvets and pillows. I couldn't do it now. It's something young people do. We lived there full-time for five or six years. The children went to school in Pont l'Abbe d'Arnoult. The house was difficult to heat in the winter but it nonetheless made a great place for kids to grow and play. The top floor became a sort unofficial youth club where our elder son and all his mates hung out. It was noisy and messy but we preferred them there where we knew where our son was, rather than have him go off in to the dark yonder. For many years everything was make-shift and make-do, but it was all a lot of fun and it is something we are proud of today. Once the elder two children had flown the nest we converted all the barns into holiday cottages, and converted the largest barn into a house for ourselves. In fact that barn remained a semi-derelict hovel for several years and we camped in it as it was until funds permitted the restoration of it. The old manoir we had lived in seemed to us to be so wonderful, compared to how it was when we bought it, that we decided to let it out as a holiday venue. But that was a mistake as it really wasn't up to scratch. We do a bit more to it each year and get plenty of re-bookings, so we are clearly getting it right these days. Catherine Broughton is a published author, blogger, poet and artist. With her husband and family, she has spent several years renovating a 17th century chateau in the Charente-Maritime department of Poitou-Charentes.